Thompson Hills Animal Clinic is a small animal clinic proudly serving Sedalia & surrounding areas. We’ve been caring for your pets like family since 1981! "Rufus the hairless Guinea Pig is hoping your week is guinea be great!" "Ares and the rest of the Thompson Hills Animal Clinic family would like to wish you a Happy Easter Weekend!" "New puppy vaccinations usually occur around 8 weeks of age, and again around 10-12 weeks. " "We're not kitten when we say we love your feedback. https://www.yelp.com/biz/thompson-hills-animal-clinic-sedalia"
"Helping your good boy feel his best." Great staff. Excellent vets. Been customers for 30 plus years. Yes, I'd like to receive news from Thompson Hills Animal Clinic. 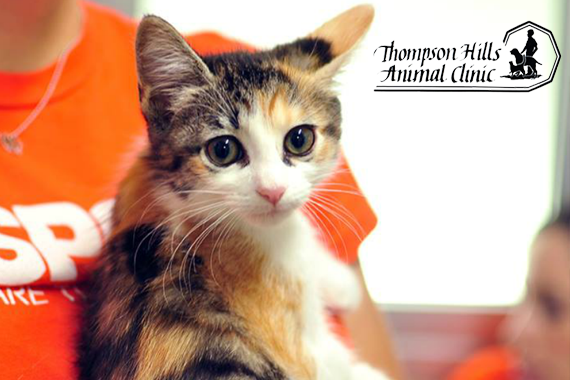 Sign up for the Thompson Hills Animal Clinic Newsletter!